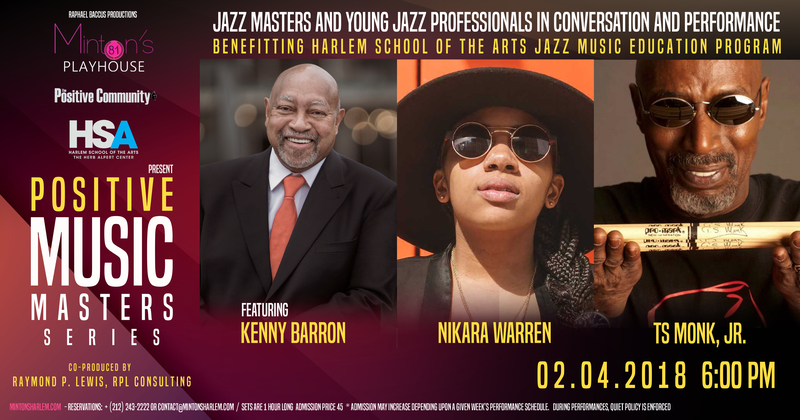 Featuring Kenny Barron, Nikara Warren, and Ts Monk, Jr. The ticket price is $45.00 per person. MINTON’S PLAYHOUSE, POSITIVE COMMUNITY, RAFAEL BENEVAIDES PRODUCTIONS AND RAYMOND P. LEWIS, RPL CONSULTING, present Positive Music Master Series. This Jazz Masters / Young Jazz Professionals conversation and performance series highlights the Historic Minton’s Playhouse, the historical significance and importance of Jazz Music the art form, Jazz Masters and their craft and contribution as well as introducing young Jazz professionals to a new generation. The monthly series will feature such notables as the great Kenny Barron, 2nd generation Jazz royalty, Thelonious Sphere Monk, Jr. (TS Monk), Nikara, the great jazz vocalist Melba Joyce formerly of the Count Basie Band, Jazz Vocalists Lezlie Harrison & Nicole Henry, Patience Higgins and Brent Birchhead to name a few (more to come). The series will run the first Monday of every month beginning February 4 – June 3, 2019. Ticket price is $45.00 PP and includes reception with the artists, talk back and performances. Hosts will include Raymond P. Lewis, Sheila Anderson (WBGO) and Bill Evans (WABC).